If you’re in the market for an inverter you can take on the construction site or one that would be great for household appliances, look no further than the Whistler Pro3,000 Watt Power Inverter. It has plenty to offer at a great price. This conveniently-sized device can put out 3,000 watts of continuous power. Better still, it will remain at a consistent level. Unlike other inverters that try matching this type of power but eventually fall off, this one doesn’t have any issues there. Plus, it is more than capable of withstanding high surges of electricity. Its peak is 6,000 watts too, which is very impressive! So long as you mount this inverter, it can easily kick out 3,000 watts (you may want a single ought “0” cable for the job) without making so much as a peep. If you leave it on the ground, a table, etc. it will definitely hum a bit. Mounted though, it’s great because with 3,000 watts you can power some seriously huge machines no matter where you are and no one is going to hear about it (this makes it great for campsites where you may want to stay up late with a laptop or, heck, even a refrigerator without keeping others awake). 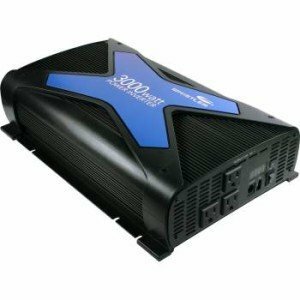 One of the most important features on the Whistler Pro-3000W 3,000 Watt Power Inverter are the fans it comes with. Obviously, it’s a safety precaution, however, these fans are also why this inverter can produce 3,000 watts as consistently as it can. Other inverters have the capability of doing so, but only for a set period of time. Without these built-in fans working for them, the inverters eventually can’t remain consistent and the wattage begins to slump. This inverter is also so effective at producing the wattage you need that some homeowners may actually use it simply because the sine waves that come out of it are often better than what utility companies can produce. The Whistler Pro-3000W power inverter comes with a handy overload indicator as well, so you’ll know when it’s time to pull back (if that time ever comes). Again, the fans also help in a big way. Furthermore, the machine was built with five different points of circuit protection. So you’re in good hands when using this machine. You’ll get three different outlets with this inverter, so you can plug in at least a few of your necessary tools or instruments. Plus, this device supports USB cables too, so your all important cell phone can get a recharge whenever necessary. We noted that this feature is overlooked by so many other models, but nowadays it is ever so important! We noted that this model usually retails for over $500. Why wouldn’t it given that it’s a beast with 3,000 watts? However, we have found this for nearly half price! You can purchase it for less than $300 on Amazon. That’s an unbelievable price for this quality wave inverter and we can’t guarantee that it will always be that cheap. Nevertheless, at just about any price, you’re getting a lot to be happy about with this converter. While you can certainly spend a lot more on an inverter if you wanted too, there’s certainly no point. With the Whistler Pro 3,000 Watt Power Inverter you get everything you need for heavy duty construction tools, consumer electronics and much more. Plus you get it in a compact package without paying too much. I like your comments on this model, however when I looked into it the company has stopped making this model. They say it has been replaced it with the whistler XP3000i @ $288.99. Is this model for a RV,12 volt, and coverts to 110-120 volt AC power. Also on some of the comments there is an issue with the fans, have you heard of this? Is this model pure sine wave unit? Thanks in advance and I await your reply.